I grew up on a healthy diet of The A-Team, Knight Rider and Magnum P.I. But by far the show which sticks in my young memory as being a well made series, is Magnum P.I. I was unsure, when I heard this was being released on Blu-ray, whether the show would stand the test of time. Had it aged well? Or is this a childhood memory that's best left unrevisited? Thankfully, on the whole, this has aged rather well. In its first season it can be hit and miss, but as the relationships between the main cast are cemented there are some truly impressive episodes. It starts off a little hit and miss - some episodes are still enjoyable, others a little cliched - but it doesn't take long for it to find it's footing. The show ran for eight seasons, from 1980 to 1988, and had a pretty simple premise. 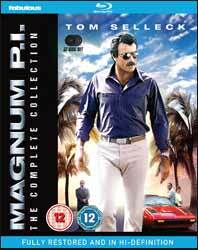 Thomas Magnum (Tom Selleck) is a retired Navy Seal who fought in Vietnam. He's currently in the employ of the author Robin Masters, as security for his lavish house and grounds. The house keeper and person employed to keep Masters's affairs in order is Jonathan Higgins (John Hillerman), an ex-British Army Sergeant Major who doesn't agree with Magnum's cavalier attitude. The two act as a sort of odd couple, with a lot of the show's humour coming from the spark between their two clashing personalities. Each week Magnum become engrossed in a new case, with which he enlists the help of his old Vietnam comrades help: "T.C." Calvin (Roger E. Mosley), who runs a local helicopter charter service for tourists and Orville Wilbur Richard "Rick" Wright (Larry Manetti) who runs a local bar. What is great about this collection is that Fabulous Films Ltd / Fremantle Media Enterprises have done the Blu-ray proud with a great high definition transfer. Obviously the aspect ratio is the old original 4:3, but like previous show's they've transferred to Blu-ray (The aforementioned The A-Team and The Incredible Hulk) the picture has never looked so crisp. Sadly the cross over episodes that dovetailed in with Simon & Simon and Murder She Wrote only contain the Magnum episodes. They don't include the other half of the story which was broadcast as part of the other shows output. It's long been documented that Selleck was the original choice to play Indiana Jones in 1980's Raiders of the Lost Ark, but that his contract with Magnum meant he was not available (sadly a writers strike actually meant that he would have finished his filming on Raiders of the Lost Ark before the delayed start of production on Magnum). For years I'd always thought Selleck was an odd choice and I was glad Harrison Ford took the role. Looking back at Selleck's character in Magnum, I feel I've misjudged him all these years. The Indiana Jones trilogy would have been a whole different affair if Selleck had been in the driving seat. Selleck has much more of a sense of humour than Ford and it would have been interesting to have seen how Selleck would have been in the role. This is something the producers of Magnum addressed as the season eight episode, Legend of the Lost Art, is a spoof of Raiders of the Lost Ark. While the RRP seems incredibly high, you have to remember that it's expensive to remaster so many episodes so that fans can watch an old series in HD. Besides, Amazon are already offering over £100 off the RRP. For fans of Magnum P.I. this is one purchase you won't regret.